By Adding Unique Special Touches! To bring out your own sense of style you need to create your own wedding dress. Have you been searching the web and the shops only to find that nothing quite meets your expectations? Then you may want to consider designing your own wedding dress. How can you get started doing this? There are 2 options listed below to help you create your own wedding dress. sweetheart neckline added to her gown." Do you see a gown that looks almost like you want, but you want to add or take away something in the design? Then why not do so! This idea is especially useful if you borrow a gown or use a family heirloom gown and the styles are dated and often need re-styling. But you can do this to new gowns as well. If you want to add color, how about adding a sash or a cummerbund to your gown. Also you can have colored beading added to areas of the gown you want to focus attention on. You can re-style the neckline of some wedding dresses. The front neckline can be made into a sweetheart shape. The back neckline can be lowered or filled in. You can add halter straps, like shown above. Sleeves can be added to a gown and also removed. You can add cap sleeves to a strapless dress if you want a little more coverage. The train on some gowns can be cut off so that you have a floor length dress all the way around, or made in to a permanent bustle pick up design. So why not create your own wedding dress the way you want it to be by re-designing it. But what if you really want something unique? Perhaps you seek a unique wedding dress color, fabric and/or design. Then you should consider getting a custom made wedding dress. Most brides think in terms of having a custom made wedding dress created for them when the gown is unique in some way. I had brides bring in pictures of two or three wedding gowns that they wanted parts of each made into one perfect wedding dress. Some brides had unusual fabrics they wanted to use or they wanted a fabric color that wasn't the normal choice. I have made baby blue, peach, pink, and yellow wedding dresses. Some designers now make wedding dresses in these colors, you just have to search for them. After you choose the pictures you want to design your wedding dress from, take them to a qualified wedding dressmaker. Do this early in your wedding planning. I'm talking no less than 9 months before your wedding. So that means you need to start interviewing dressmakers at least 12 months before the wedding. Why so early? You will find it is not going to be easy to find someone to make your dress. It may take months. Depending on where you live you may have to be willing to travel. And there is a chance you won't find anyone at all. In some areas of the country you will find that there is a shortage of sewing professionals. If this happens to you, you will still have time to go buy a dress since you started looking early. If you can't find someone to create a custom wedding dress for you... then your back up plan can be perhaps to find one that can be re-designed as mentioned in the above section. 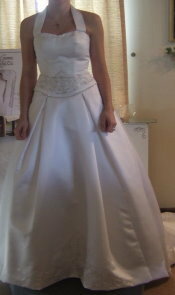 Now again.... you most likely will find that it is hard to find a dressmaker who will custom make a wedding dress. But if you are fortunate to live in an area where you can easily find a dressmaker, then try to diligently look for at least 2 people so you can compare their work and services. For a list of qualified dressmakers check out this website www.paccprofessionals.org. Go to the directory and see who may be near your area. Don't just use the first one you come across, unless they came highly recommended or they measure up to the standards you are looking for. With the help of a qualified sewing professional, you truly can create your own wedding dress! When you need to get your ideas on paper this is one way to visualize your wedding gown. Learn how to create your own wedding dress by making a collage of your ideas. If you would like to draw your wedding dress design but don't have drawing skills try this easy method. If you have good sewing skills, have you considered making you wedding gown? Here are some pointers on how to go about it.